The awards for the top winner this year included: Best Picture, Best Actor, Best Supporting Actress, Best Director, Best Story/Screenplay (Budd Schulberg), Best B/W Cinematography (Boris Kaufman), Best B/W Art/Set Direction, and Best Film Editing. The low-budget, black and white Best Picture was filmed entirely on location in Hoboken and told the gritty story of New York dock workers, brutality, corruption, and embroilment with a gangster union boss. It provided an expose of union racketeering while showcasing the murder of an innocent longshoreman. Kazan and screenwriter Budd Schulberg justified their own naming of names (blacklisting-testimony against alleged Communists) as friendly witnesses before the House Un-American Activities Committee (HUAC) in the early 50s with the film's story of an heroic longshoreman informant Terry Malloy (Marlon Brando) who stood alone and turned witness against the corrupt and intimidating union bosses and became a marked 'pigeon'. The film marked a comeback for Brando, who hadn't won a Best Actor Oscar - yet. 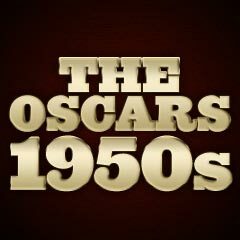 1954 was another upset year in the Academy Awards, particularly in the Best Actor and Actress categories, where each favored nominee lost. Marlon Brando's Best Actor victory (he was "a contender" with his fourth consecutive nomination since 1951, and first win!) 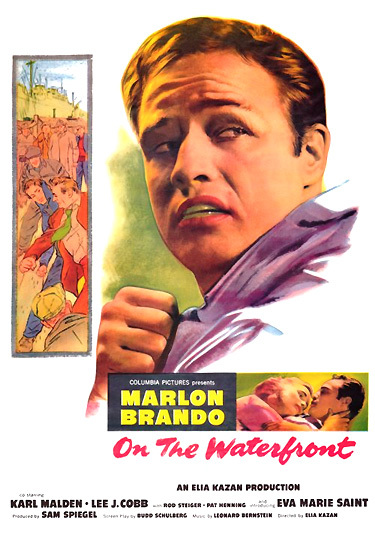 was for his role as the confused, ex-prizefighter and roughneck longshoreman Terry Malloy, a racketeer's stooge in Elia Kazan's On The Waterfront. The win was a surprise one (Bing Crosby was favored), but a deserved one. His transformation from passive dockworker to a crusader against trade-union tyranny is impressive. veteran musical-performer Judy Garland, who was favored to win because of a return to film after four years of personal problems, including breakdowns, attempted suicide, drug problems, and bankruptcy. With her first of two unsuccessful career nominations, Judy Garland played the wife of an alcoholic - a comeback role as Esther Blodgett/Vicki Lester in George Cukor's remake of the 1937 Fredric March/Janet Gaynor film - A Star Is Born. The fourth nominee was Tom Tully (with his sole career nomination) as The Caine's skipper Captain DeVriess (before Bogart took charge) in The Caine Mutiny. The Best Color Costume Design Oscar was presented to Sanzo Wada for Gate of Hell - this marked the first Japanese-made film to win a competitive award. Another Honorary Award was presented to the versatile, red-haired comic Danny Kaye, for "his unique talents, his service to the Academy, the motion picture industry, and the American people." He never even received a nomination throughout his entire film career, that was marked by such great films as Wonder Man (1945), The Kid From Brooklyn (1946), The Secret Life of Walter Mitty (1947), Hans Christian Andersen (1952), Knock on Wood (1954), and The Court Jester (1956). While Hitchcock was nominated as Best Director for Rear Window, the film should have also been nominated for Best Picture, replacing inferior films such as: Three Coins in the Fountain, The Caine Mutiny, and The Country Girl. Three stars of Rear Window (with four nominations, and none for acting), James Stewart (as 'Jeff' Jefferies), Grace Kelly (as Lisa Carol Fremont), and Thelma Ritter (as Stella) were not nominated (the studio - Paramount - promoted Kelly in its other film The Country Girl instead). Another better candidate for Best Picture which wasn't nominated was George Cukor's A Star Is Born, due in part to Warner Bros.' decision to ignore the film during Academy promotions. Director Nicholas Ray's independent, odd cult Western Johnny Guitar with Sterling Hayden, Joan Crawford and Mercedes McCambridge in lead roles, was entirely unnominated. Two other films that deserved more recognition included Douglas Sirk's melodramatic Magnificent Obsession with Jane Wyman (who received a Best Actress nomination, the film's sole honor) and Rock Hudson, and John Huston's quirky adventure comedy Beat the Devil (without nominations) with Humphrey Bogart. And why wasn't Fred MacMurray nominated (he was never nominated in his entire career) instead of Tom Tully, for his stronger performance as cynical troublemaker Captain Keefer in The Caine Mutiny? And Charles Laughton was neglected for his role as Henry Horatio Hobson in David Lean's un-nominated British comedy Hobson's Choice. Judy Holliday failed to receive a nomination for her role as Gladys Glover in another Gordon-Kanin-Cukor comedy/satire It Should Happen to You (a film with only one nomination - Best Costume Design) - she co-starred with Jack Lemmon in his film debut. American-born Composer Larry Adler (blacklisted and self-exiled in England) saw his nominated score for Genevieve credited to conductor-arranger Muir Matheson. (The Academy would correct the nomination in 1986.) And the great choreographer Michael Kidd (with no career nominations), responsible for the high-stepping and dancing in Best Picture-nominated Seven Brides for Seven Brothers, finally was given some recognition by a special Honorary Award in 1996 presented by the Academy.